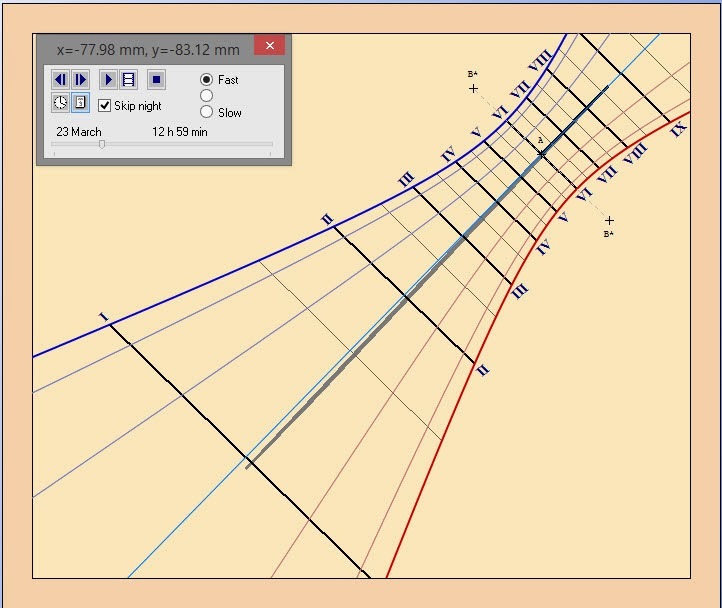 I’ve been stewing over this post for some time because it has been hard for me to wrap my head around how sundials work. I think the modern age has rotted my brain. 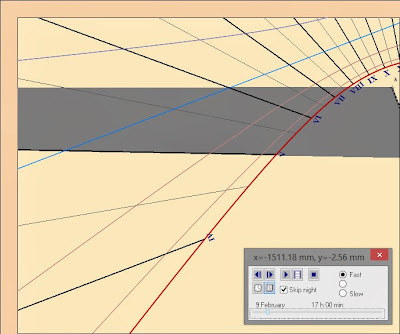 Shadows Pro – Sundial Overview – All roads in researching sundials on the Internet sooner or later lead to the Shadows Pro software. I’ve used the free (limited) version to create some images below. 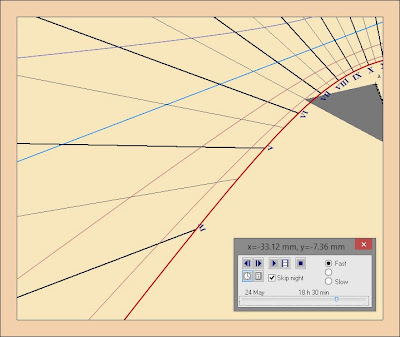 Sundials on the Internet – Includes lots of sundial resources, a bit busy and hard to navigate. 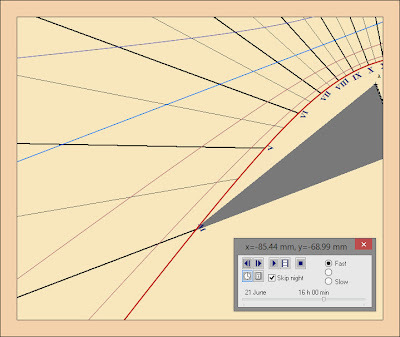 Analemma – Learn more about the “figure-8” that you often see on sundials. Queen’s College Sundial – Contains a detailed explanation of the Queen’s College dial. Along the way you get a good explanation of how to read the time of year from a sundial that includes the path of sun (declination arcs). Timekeeping in the Ancient World: Sundials – Contains one of the best historically-motivated explanations of hyperbolae created on a sundial that trace the path of sun, and in particular, the summer solstice and winter solstice lines. The British Sundial Society Page - Has a good model of sundial with solstice lines and callouts to all the parts of a sundial. 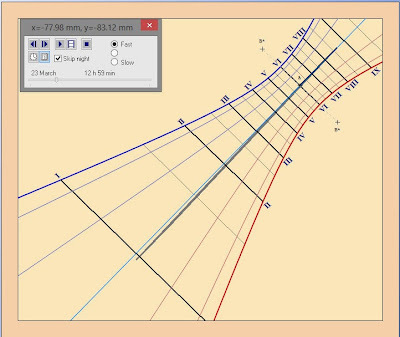 The Sundial and Geometry – An Introduction for the Classroom [pdf] by Lawrence E. Jones. This was one of the easiest introductions to read. 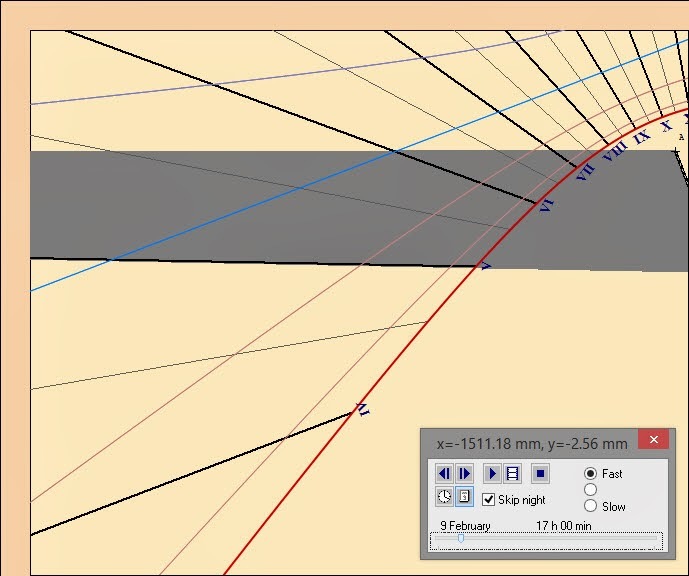 Timelines – Walking Shadow Lines – Includes many images of sundials with annotations explaining how the dials are used. In particular, many sundials of the Prague Clementinum are shown. Sulla Cresta dell’Onda site has a page dedicated to sundials of Mondovì (Le meridiane di Mondovì). All of the sundials (meridiana in Italian) we show here are vertical sundials. Vertical sundials are such that the sun can strike them, all or some part of the year. There can be northern facing sundials, which does make my head spin a little to think about. Location: On the path to Santuario di Santa Lucia outside of Villanova Mondovi (location). Orientation: Faces southeast. Notes: Contains four zodiac signs. Capricorn(♑) – the Goat, winter solstice. Aries (♈)– the Ram, spring equinox. Libra (♎) - the Scales, autumn equinox. Cancer (♋) – the Crab, summer solstice. Orientation: North by northwest approximately. Notes: We ate a very nice dinner at Trattatoria Marsupino in this building. We go the pleasant meal part right. The coordinates of Briaglia are 44.4000° N, 7.8833° E (44 24’ N, 7 53’E). This more or less northern facing dial is unusable from about early November to early February. This date range is what I simuated using using Shadows Pro, a useful program for ceating sundials and simulating shadows on the dial for times throughout the year. To create these images, I created a vertical sundial at the coordinates for Briaglia, with the sundial declination of approximately 158 degrees west. The red line is the summer solstice and the winter solstice is not visible because it’s not useful for this dial. This dial, during a small part of the year, is lit during the morning. We did not show that here. The picture was taken on 5/24/13 at 7:30 pm. I also simulated what the sun dial should be showing (removing daylight savings time) and I get about 6:30 pm. The gnomon shadow is hard to make out in the photo, but it’s just over VI. Shadows Pro-Created Images of the Sundial in Briaglia. From left to right: Image 1: Summer solstice at 4 pm. Image 2: The day we were there May 24, 2013 at 6:30 pm. (We were on daylights saving time so it was really 7:30 pm.) Image 3: Approximately the last day in Fall when sun stops hitting the dial. Image 4: Approximately the first day in Winter when the sun starts hitting the dial. Notes: We were visiting someone in this building. Nearby is the famous “Bue Grasso di Carrú” sculpture. Italian hours (hours since last sunset) are shown. Left: Sundial in Carrù, Italy; Right: Annotated sundial. Orientation: Faces south by southwest. Notes: On the left side of the window, local time is shown. On the right side of the windows, it looks like Italian hours. Notes: Date taken 5/23/13 at 8:17 am (local time). The gnomon shadow is near 7, so the dial doesn’t account of daylight savings time. Because the shadow is below the equinox line, we are in summer. Orientation: Uncertain, but approximately south-facing. Notes: This sundial shows daylight savings time in Arabic numbers and non-daylight savings time in Roman numerals. This photo was taken: 5/26/13 at 8:31 am (local time). On this date, Italy would be on daylight savings time (“spring” ahead) so we read the Arabic numbers and we see we are between 8 and 9 am. Saying: El Me’ Travaij o L’è col…ed fete passe’ el temp [In Piemontese… a saying about work and the passing of time? ]Notes: Villanova Mondovì, Coordinates 44.3500° N, 7.7667° E. This dial shows equal hours. 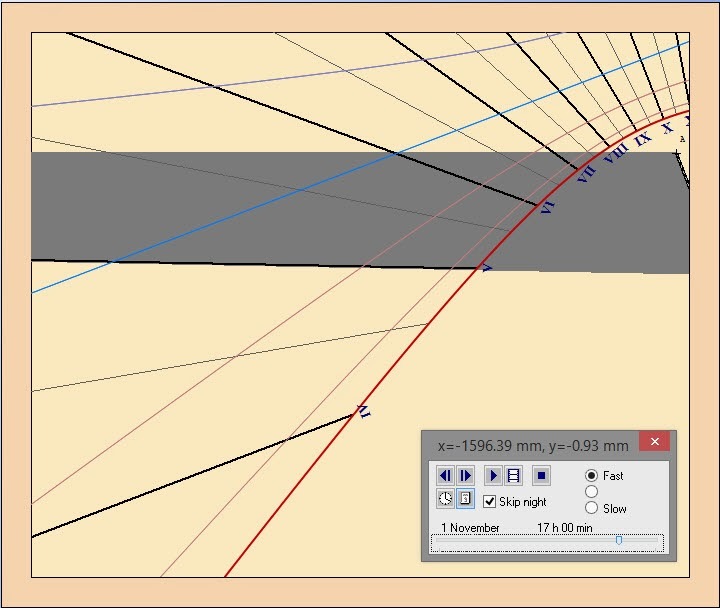 The three images of the simulated sundial are from the program Shadows Pro. 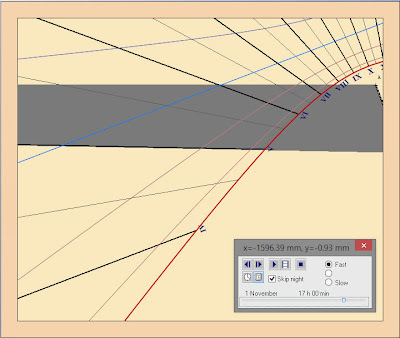 To create these images, I created a vertical sundial at the coordinates above, facing west. 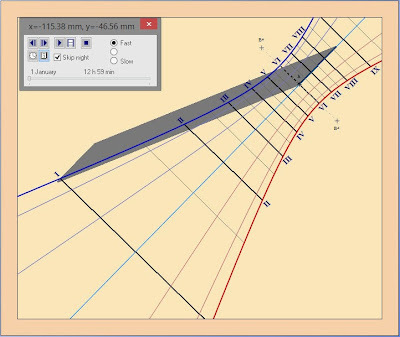 The red line is summer solstice and the blue line is winter solstice declination line. Shadows Pro-Created Images of the Sundial in Briaglia. 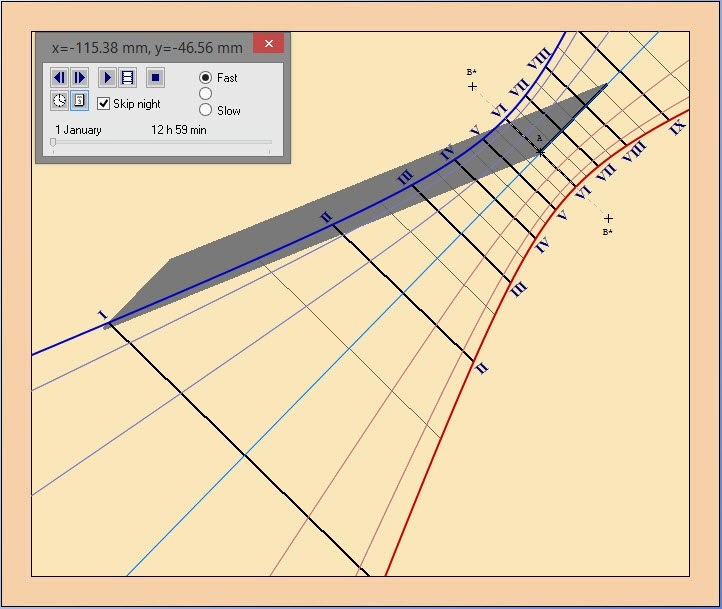 Image 1: The sundial simulated on January 1st, shadow on the winter solstice line. 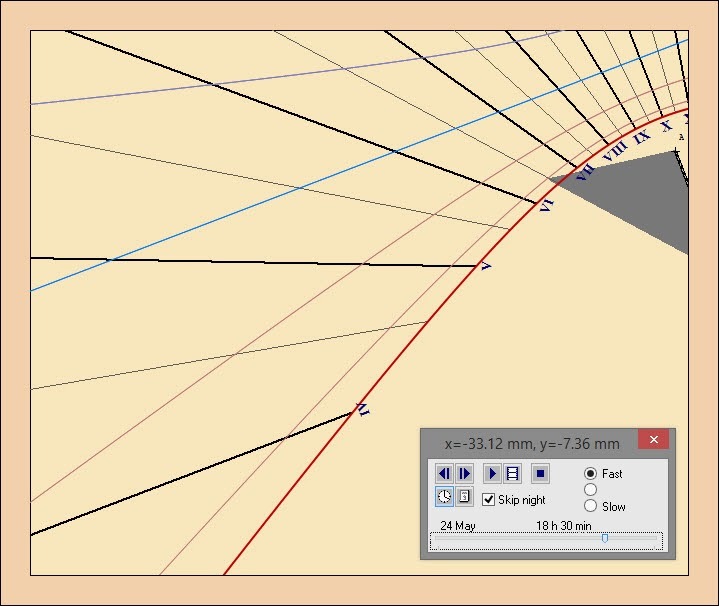 Image 2: The sundial simulated on March 23rd, shadow on the equinox line. 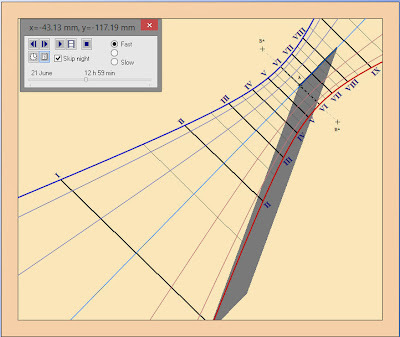 Image 3: The sundial simulated on June 21st, shadow on the summer solstice line. Notes: Not a sundial, but a play on them. Orientation: Meridiana XIV faces Northeast; Meridiana XV faces South by Southeast. Meridiana XIV is similar to Meridiana III (Carrù), showing Italian hours. Notes: Photo taken 5/27/13 at 4:49 pm (local time). The top sundial reads about 3:30 pm, off because of daylight savings time. The top sundial is equal hours. The bottom sundial contains equal hours and Babylonian hours (slanted down to the right). Notes: The sundial contains equal hours and Babylonian hours (slanted down to the right). French Hours(Ore Francesi) which was an early name for the equal hour system with two 12 hours days that began at midday and midnight. Italian or Italic Hours (Ore Italiche) – the number of hours elapsed since the most recent sunset (hour 0) with 24 equal hours per day. Also referred to as an Hours Before Sunset Sundial. Babylonian Hours – the number of elapsed since the most recent sunrise (hour 0) with 23 equal hours per day. Unequal Hours or Biblical – 12 hours between sunrise an sunset, or during the night between sunset and the following sunrise. The duration of the hours can vary between 40 to 80 minutes during the year.